Special P-body Portal Replica is Limited to 500 Pieces Only! Don’t miss your chance to own the rarest edition of one of this year’s hottest collectables! 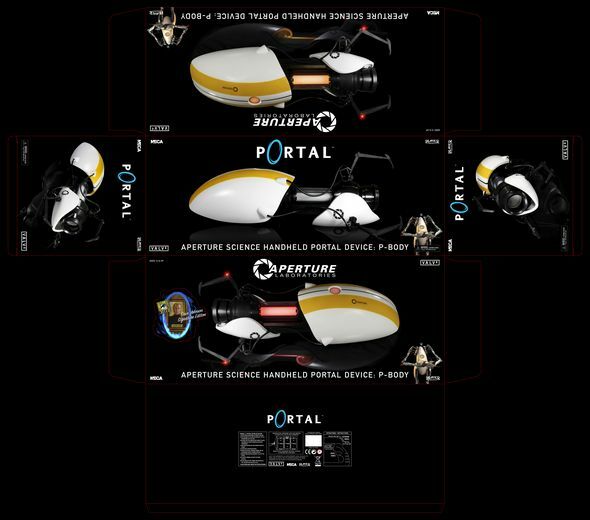 After an amazing round of 2012 Comic-Con exclusives, we’ve got one more special item we’re bringing with us to San Diego: The “Cave Johnson” Edition Portal P-body ASHPD Replica! If you know Valve’s groundbreaking puzzle game, then you know the Aperture Science Handheld Portal Device (ASHPD) as the gun that lets you make the portals for which the franchise is named. We received such an overwhelming response when we released the first ASHPD prop replica that bringing one to Comic-Con seemed inevitable. Bill Fletcher, the in-game model for the head of Aperture Science, Cave Johnson, is going to be making a special appearance at Comic-Con, and it’s for his character that the “Cave Johnson” Edition P-Body ASHPD is named. Mr. Fletcher is scheduled to appear and sign autographs & pose for photographs. We’re only making 500 of these, and we’re only bringing 250 to SDCC (why don’t you try carrying 500 boxes of Portal replicas??? ), so if you’re going to be there, make sure you get yours while you can! A signed 8×10.5in portrait of Cave Johnson will also accompany all 500 units. And if you’re not going to be there, you might be wondering what we’re going to be doing with those other 250 ASHPDs. Good question. Stick around tomorrow to find out the answer. Cant Wait For Comic Con? Like we said, make sure you check back in for that big announcement for everyone who’s not getting out to SDCC this year. Much like this limited-as-all-hell edition ASHPD, you won’t want to miss it! We hope you’ve enjoyed the SDCC reveals as much as we’ve enjoyed bringing them to you. We know this is going to be the best Comic-Con yet, and we’ll be there the whole time rockin’ out at booth #3145. Make sure you swing by and say hello. Shipping This Week – Ultimate Pt 3 Jason, Piece of Mind Iron Maiden, Portal 2 Chell, and Ultimate 1/4 Scale Deadpool! Shipping this Week: Portal 2 Atlas and P-Body Light-Up Action Figures! “Jingle all the Way to 30k” Giveaway – Win Cool Prizes on Facebook! BTS – Portal 2 Atlas Action Figure Coming Spring 2013!